yoyorecreation - High End Offstring Performance! Yoyorecreation is constantly pushing the limits of yo-yo design and trying to come up with innovative new ways to improve on each new model. 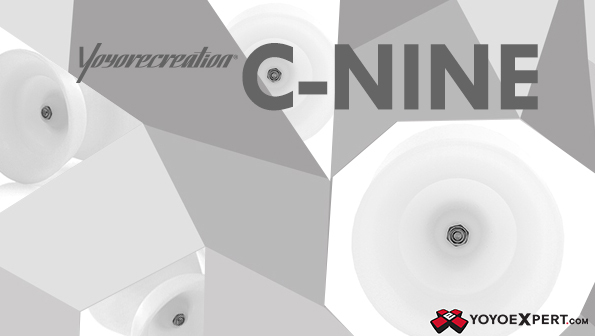 They've come out with a bunch of new yo-yos recently, but one of the most notable is their latest offstring offering - The C-NINE! Yoyorecreation worked with 4A player Atsushi Nakamura to design a cool new 4A yo-yo that would fit his unique style of delicate regenerations and dynamic tech. They wanted to give the C-Nine a smaller diameter, but in order to create this design without sacrificing performance they had to strike a really unique balance of body shape and weight distribution. The end result is a center weighted regen monster with a width that makes hitting those tough bangers a breeze! It's a little on the smaller side and looks a little clunky, but watch Takumi Yasumoto's 2nd place performance at the 2015 WYYC and you'll see what big things the C-Nine can do!